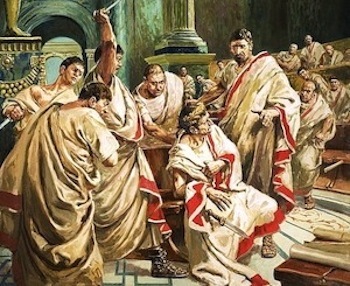 “It had been decided by them (the c. 40 conspirators who wanted to return Rome to a Republic after Caesar had declared himself Dictator For Life) to make the attempt in the senate, for they thought that there Caesar would least expect to be harmed in any way and would thus fall an easier victim, while they would find a safe opportunity by having swords instead of documents brought into the chamber in boxes, and the rest, being unarmed, would not be able to offer any resistance. But in case any one should be so rash, they hoped at least that the gladiators, many of whom they had previously stationed in Pompey’s Theater under the pretext that they were to contend there, would come to their aid; for these were to lie in wait somewhere there in a certain room of the peristyle. So the conspirators, when the appointed day was come, gathered in the senate-house at dawn and called for Caesar. As for him, he was warned of the plot in advance by soothsayers, and was warned also by dreams. For the night before he was slain his wife dreamed that their house had fallen in ruins and that her husband had been wounded by some men and had taken refuge in her bosom; and Caesar dreamed he was raised aloft upon the clouds and grasped the hand of Jupiter. Moreover, omens not a few and not without significance came to him: the arms of Mars, at that time deposited in his house, according to ancient custom, by virtue of his position as high priest, made a great noise at night, and the doors of the chamber where he slept opened of their own accord. Moreover, the sacrifices which he offered because of these occurrences were not at all favorable, and the birds he used in divination forbade him to leave the house. 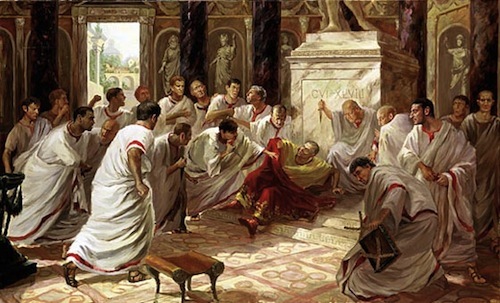 Indeed, to some the incident of his golden chair seemed ominous, at least after his murder; for the attendant, when Caesar delayed his coming, had carried it out of the senate, thinking that there now would be no need of it. 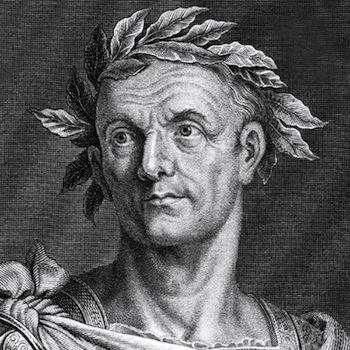 Caesar, accordingly, was so long in coming that the conspirators feared there might be a postponement, — indeed, a rumor got abroad that he would remain at home that day, — and that their plot would thus fall through and they themselves would be detected. 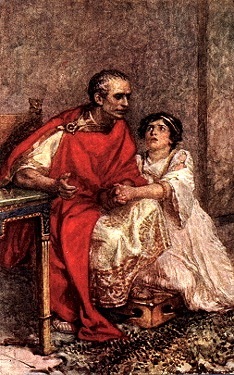 19th-century painting by Abel de Pujol: Caesar, with Brutus, leaves his wife Calpurnia on the Ides of March. Now when he finally reached the senate, Trebonius kept Antony employed somewhere at a distance outside. 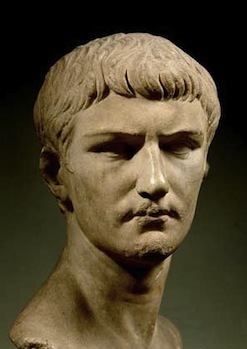 For, though they had planned to kill both him and Lepidus, they feared they might be maligned as a result of the number they destroyed, on the ground that they had slain Caesar to gain supreme power and not to set free the city, as they pretended; and therefore they did not wish Antony even to be present at the slaying. As for Lepidus, he had set out on a campaign and was in the suburbs. 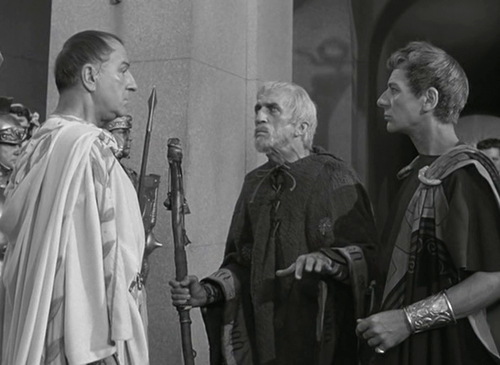 When Trebonius, then talked with Antony, the rest in a body surrounded Caesar, who was as easy of access and as affable as any one could be; and some conversed with him, while others made as if to present petitions to him, so that suspicion might be as far from his mind as possible. 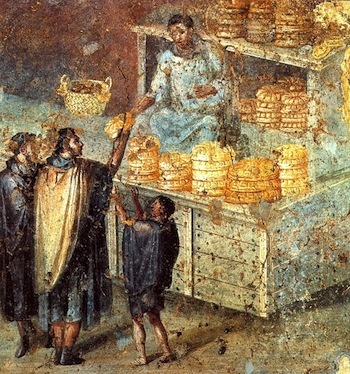 And when the right moment came, one of them approached him, as if to express his thanks for some favor or other, and pulled his toga from his shoulder, thus giving the signal that had been agreed upon by the conspirators. 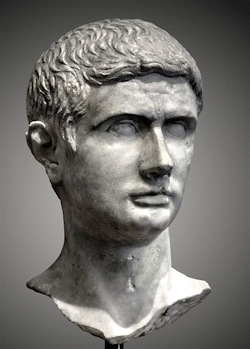 If one compares the busts of a young Brutus and a young Caesar, there is a resemblance (see below). 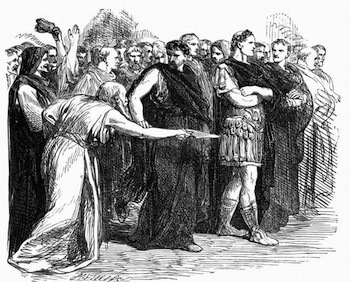 “More than sixty joined the conspiracy against him, led by Gaius Cassius and Marcus and Decimus Brutus. At first they hesitated whether to form two divisions at the elections in the Campus Martius, so that while some hurled him from the bridge as he summoned the tribes to vote, the rest might wait below and slay him; or to set upon him in the Sacred Way or at the entrance to the theatre. 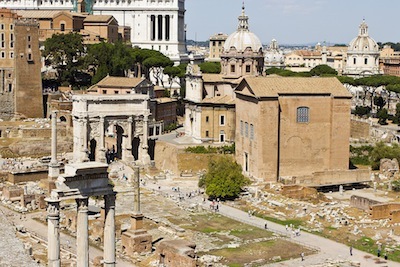 When, however, a meeting of the Senate was called for the Ides of March in the Hall of Pompey, they readily gave that time and place the preference…. Now Caesar’s approaching murder was foretold to him by unmistakable signs. A few months before, when the settlers assigned to the colony at Capua by the Julian Law were demolishing some tombs of great antiquity, to build country houses, and plied their work with the greater vigor because as they rummaged about they found a quantity of vases of ancient workmanship, there was discovered in a tomb, which was said to be that of Capys, the founder of Capua, a bronze tablet, inscribed with Greek words and characters to this purport: “Whenever the bones of Capys shall be moved, it will come to pass that a son of Ilium shall be slain at the hands of his kindred, and presently avenged at heavy cost to Italy.” And let no one think this tale a myth or a lie, for it is vouched for by Cornelius Balbus, an intimate friend of Caesar. Shortly before his death, as he was told, the herds of horses which he had dedicated to the river Rubicon when he crossed it (January 49 BC), and had let loose without a keeper, stubbornly refused to graze and wept copiously. Again, when he was offering sacrifice, the soothsayer Spurinna warned him to beware of danger, which would come not later than the Ides of March; and on the day before the Ides of that month a little bird called the king-bird flew into the Hall of Pompey with a sprig of laurel, pursued by others of various kinds from the grove hard by, which tore it to pieces in the hall. 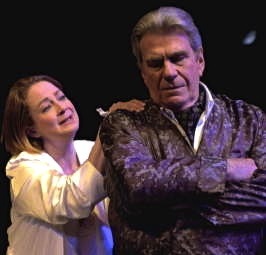 In fact the very night before his murder he dreamt now that he was flying above the clouds, and now that he was clasping the hand of Jupiter; and his wife Calpurnia thought that the pediment of their house fell, and that her husband was stabbed in her arms; and on a sudden the door of the room flew open of its own accord. 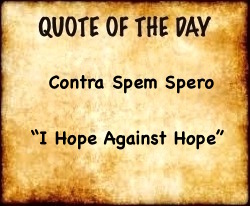 Both for these reasons and because of poor health he hesitated for a long time whether to stay at home and put off what he had planned to do in the senate; but at last, urged by Decimus Brutus not to disappoint the full meeting which had for some time been waiting for him, he went forth almost at the end of the fifth hour (11:00 AM); and when a note revealing the plot was handed him by someone on the way, he put it with others which he held in his left hand, intending to read them presently. 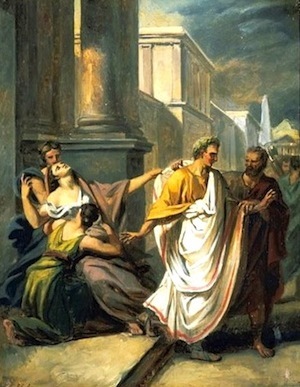 Then, after several victims had been slain, and he could not get favorable omens, he entered the House in defiance of portents, laughing at Spurinna and calling him a false prophet, because the Ides of March were come without bringing him harm; though Spurinna replied that they had of a truth come, but they had not gone. 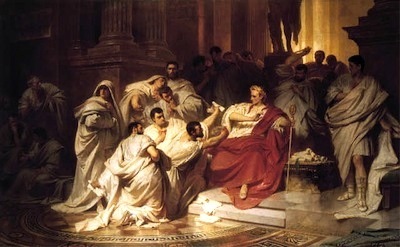 As he took his seat, the conspirators gathered about him as if to pay their respects, and straightway Tillius Cimber, who had assumed the lead, came nearer as though to ask something; and when Caesar with a gesture put him off to another time, Cimber caught his toga by both shoulders; then as Caesar cried, ‘Why, this is violence!’ one of the Cascas stabbed him from one side just below the throat. Caesar caught Casca’s arm and ran it through with his stylus, but as he tried to leap to his feet, he was stopped by another wound. 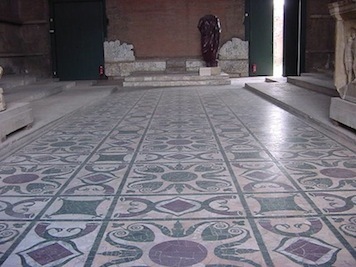 The Roman Senate Floor with multiple marble types from all over the Empire to show they ruled the world. Julius Caesar fell dead on this floor.